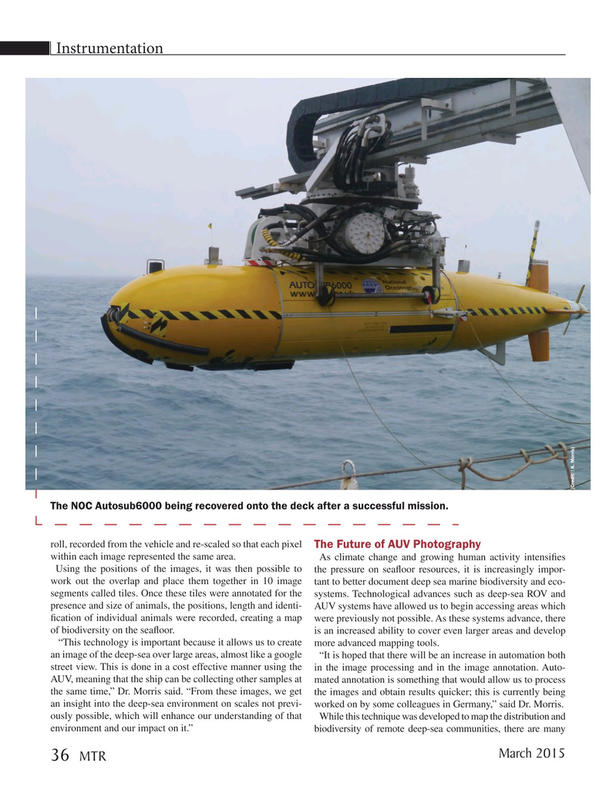 The NOC Autosub6000 being recovered onto the deck after a successful mission. Using the positions of the images, it was then possible to the pressure on sea? oor resources, it is increasingly impor- work out the overlap and place them together in 10 image tant to better document deep sea marine biodiversity and eco- segments called tiles. Once these tiles were annotated for the systems. Technological advances such as deep-sea ROV and presence and size of animals, the positions, length and identi- AUV systems have allowed us to begin accessing areas which ? cation of individual animals were recorded, creating a map were previously not possible. As these systems advance, there of biodiversity on the sea? oor. is an increased ability to cover even larger areas and develop “This technology is important because it allows us to create more advanced mapping tools.